I feel Mahindra went little greedier, it has overpriced the higher models for the engine size and features it has been providing. All above mentioned omissions could have been provided at this price along with 6 air-bags and sunroof (although just a gimmickry stuff for India). I fear the car will be twice killed, at one end by Ertiga and at another end by both Crysta 'G' and Hexa XMA as a privately owned car. Last edited by HighwayofLife : 9th November 2018 at 17:10. Didn't look at it that way . But still, won't the TUV300 Plus be lighter to drive in city due to almost instant torque delivery? While I agree the other parameters that Sir, you have mentioned will turn most buyers away from the TUV. I don't mean to offend you in any way, but if possible in the future, take your car with 6-7 passengers and their luggage to any hilly areas, like Himachal or Uttrakhand, and you will realise why that there is no replacement for displacement. The 300nm of torque will become useless. The 1.5l engines are heavily reliant on their turbo chargers for power and torque, the TUV300 Plus or maybe an old gen Scorpio (pre 2017) have lesser power and torque figures than yours but they will happily climb the mountains. Take a Tata Sumo 3.0, and you will be surprised climbing the steepest slopes in 3rd gear even though its power and torque figures are way below any of those mentioned before. However good the 1.5 becomes, it can't match a 2.2, because bigger turbos take their time to spool and build boost. Having said that, based on your analysis, I agree that the difference might not be as perceivable in the city as I was claiming but try to get your hands on a bigger diesel with lower power and torque figures, and take it for a spin, you'll know what I am saying. I don't mean to offend you in any way, but if possible in the future, take your car with 6-7 passengers and their luggage to any hilly areas, like Himachal or Uttrakhand, and you will realise why that there is no replacement for displacement. The 300nm of torque will become useless. The 1.5l engines are heavily reliant on their turbo chargers for power and torque, the TUV300 Plus or maybe an old gen Scorpio (pre 2017) have lesser power and torque figures than yours but they will happily climb the mountains. Take a Tata Sumo 3.0, and you will be surprised climbing the steepest slopes in 3rd gear even though its power and torque figures are way below any of those mentioned before. Fantastic review, thank you to everyone that contributed to it. After the XUV 500, this is the second Mahindra product that feels modern and a fairly mature offering. If this turns out to be reliable, Toyota ought to be worried. Did you folks get a chance to ask Mahindra engineers about the safety aspect of the Marazzo's design? The body-on-chassis design coupled with the engine being pushed back makes me a little uneasy about its crash-worthiness. Top M&M executive: "Hey, look, we are going to build a kickass MUV. Lets get some super dudes onboard"
The go getter executive: " Yes Sir, We got competitive product designers to design the body, excellent product specialists to define the feature set, capable engineers to build the engine, amazing mechs to tune the suspension and wonderful architects to design the engine bay layout"
Car enthusiast: " Heck! every one did their job splendidly. Marazzo looks good in each of the departments but fails to impress as a whole car "
The feedback from the screen is quite nice, in my view, and you certainly feel it. It's more responsive than the Pioneer 2-DIN HU that I had in my Scorpio. And one very nice touch- the HU stays on when you start the car, without switching off when the engine cranks- don't recall how this works in XUV. This isn't the case with the stock HUs that I've seen (may be I haven't noticed enough) and definitely not with aftermarket units. I absolutely adored this feature. So you can actually feel a vibration from the screen? Or are you saying that the touch sensitivity is good? My question is mainly related to how good the haptic feedback is and whether it is noticeable or not. This is definitely for keeping the trip sheet books for cabbies. Excellent review! While some are predicting that Ertiga and Innova will squeeze this from both ends, I see this the other way around. That huge chasm between those two price points is now filled with a people mover that does most things that either of them do at a higher or lower price. What remains now is to watch how this platform ages over the car life without rattles / issues. Pleased to hear that the interior is silent, one of the major gripes for me. As a potential Marazzo customer, the ONLY thing I really do not like about this MUV is the engine bay. I am of the type who tinkers with the engine bay a lot like checking battery water level, replacing oil, changing coolant etc. This tight engine bay makes everything so much more difficult. Mahindra may have made default access to the engine bay from the underside because all service centers use 4 post lifts by default, so for them these are no big issues. Also access to service manual is a must, else the car becomes a dealer income generator and no customer satisfaction for a DIYer. Maybe Mahindra can also introduce more engine variants in future like Innova 2.4 and 2.8.
as a potential marazzo customer, the ONLY thing I really do not like about this MUV is the engine bay. I am of the type who tinkers with engine bay a lot like checking battery water level, replacing oil, changing coolant etc. This tight engine bay makes everything so much more difficult. Completely agreed that this car would hard to work on for a tinkerer/DIYer. 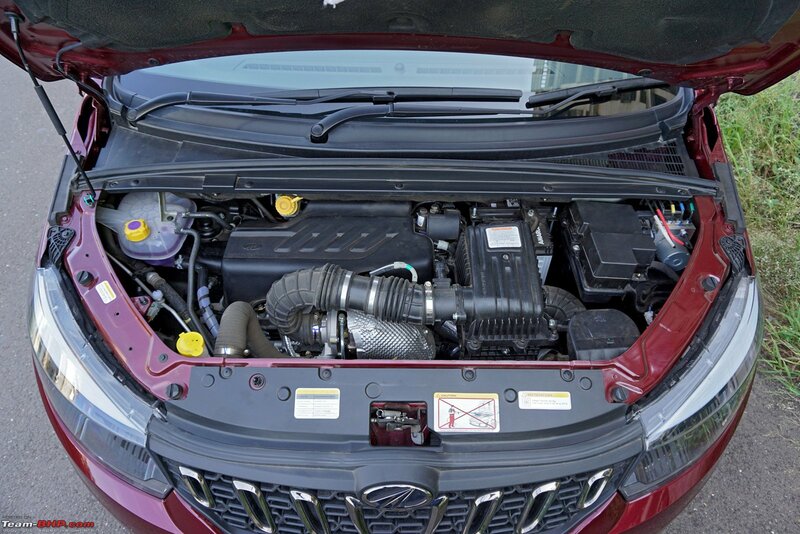 Maybe mahindra can also introduce more engine varients in future like Innova 2.4 and 2.8. I think that Mahindra might have painted themselves into a corner with this engine (and the FWD layout). It's such a tight fit, that I don't see a bigger engine being shoehorned in. As a potential marazzo customer, I am put off by 3 things. 2. Lack of low end grunt, and engine stalling - I wish mahindra would detune the engine. I could live with 100 bhp peak power, but need more low end torque. And engine stalling is simply unacceptable. the ONLY thing I really do not like about this MUV is the engine bay. I am of the type who tinkers with engine bay a lot like checking battery water level, replacing oil, changing coolant etc. This tight engine bay makes everything so much more difficult. If that's the only thing holding you back, go ahead & buy it. All the routine service that today's cars require is a single visit to the workshop every 10,000 - 15,000 km. To most private owners, that is one visit a year that usually takes 1 or 2 days. The current gen of cars don't need any tinkering under the hood. However, I would advise you to wait for a year or so (more the better). Have yet to see a brand new Mahindra car or engine without niggles in the early production batches. At this price point, if M&M can demonstrate reliability with the electronics and the new powertrain, then it can give Toyota some run atleast from the cab fleet market. Very GOOD Review - definitely worth the 5 star rating that I have given it! My two bits - Since 2015, I have decided that I will own only automatics. In this background, I had stopped studying the Marazzo. Your review has triggered a new interest in this offering from Mahindra. Now I will wait for the automatic to arrive. Then I will wait for your review of that. THEN, I will think about it. Presently, I have a Jazz V CVT and Scorpio S10 AT. Both are doing a good job. Still I think I got that 'keeda' - I can't stop looking at new models! I always thought that automatics of all type use more space in the engine bay - at least in comparison to the manual types. Am I right or wrong? If I am right, and if the engine is a real tight-pack, then I am wondering whether an automatic version will at all be launched!? Or, will they reduce the engine capacity further?? Ouch! Just curious.